It’s all about the ‘Za. And not just any pizza. We’re talking thin crust, a little bit crispy, and a sauce-to-cheese ratio that is just right, every time. Of course all the ingredients are fresh and every pie is made out in the open in full view of the customers. 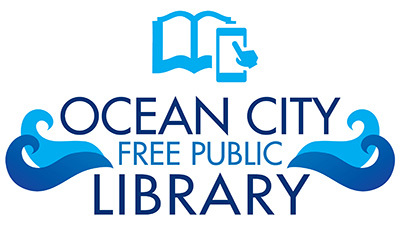 The service is fast and friendly and the atmosphere is pure Ocean City. It can only be Manco & Manco. 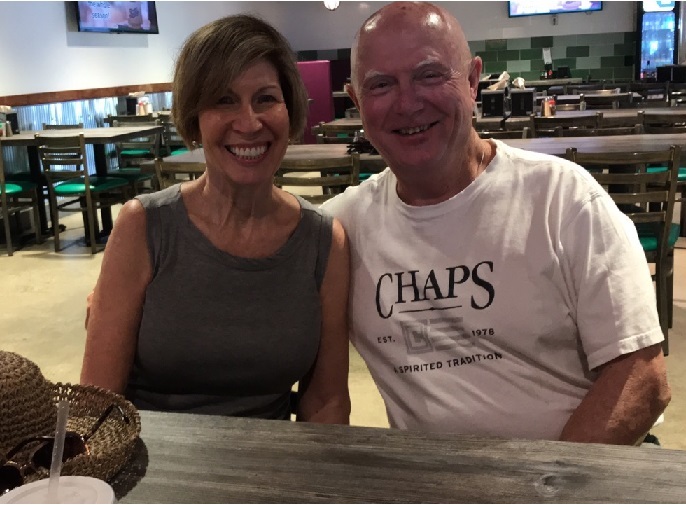 “You can’t get a bad pizza here,” said longtime customer Franny Quinn who was enjoying slices recently with wife Madelyn. The couple, from the Roxboro section of Philadelphia, have been married for 49 years and estimated they have been eating Manco and Manco for just as long. Franny and Madelyn Quinn have been coming to Manco’s for more than 40 years. That’s not quite true anymore, as Mancos has expanded its menu from its original offerings of plain pizza and soda to a variety of pies and toppings, and also chicken wings and tenders and french fries. But Quinn’s point still has validity. 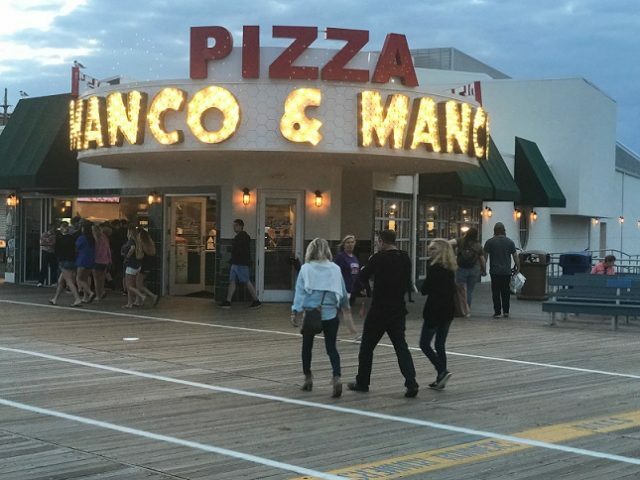 Pizza remains Manco and Manco’s primary stock in trade and the reason the business, now in its 62nd year, has achieved iconic status on the Ocean City Boardwalk. There are many other places to buy pizza — and excellent pizza at that — on the boards. However if there is a line stretching far outside the store, it’s a pretty safe bet that it’s Manco & Manco’s. Smiles come free of charge with an order of Manco & Manco Pizza. Staff is held to the same strict standards as the pizza. Male workers must have short hair and their white shorts must have a belt and must be clean. Staffers tend to stay and make it a career. “If you work hard and do a good job there is opportunity for advancement,” said Warlow. Another manager, Chris Mazzitelli, has worked for Manco for 33 years. “That speaks volumes right there about how the company treats its employees,” Warlow added. 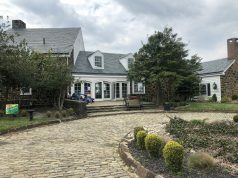 Other longtime employees include Dave Evans, Tom Rossi, Matt Miller and Rich Cicconetti. The six, in collaboration with other staff, form a de facto marketing committee. 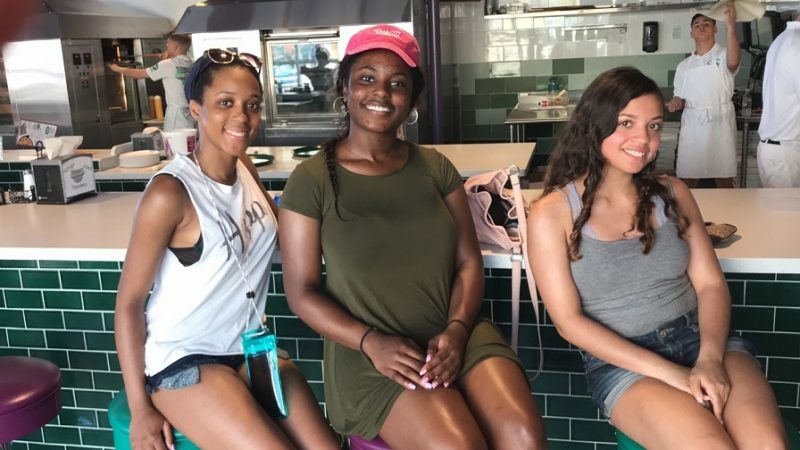 The group comes up with new ideas such as the new cheesesteak pizza, and the “Philly Special” deal named after the famous Eagles play in the Super Bowl. Five of the six men are Ocean City natives. 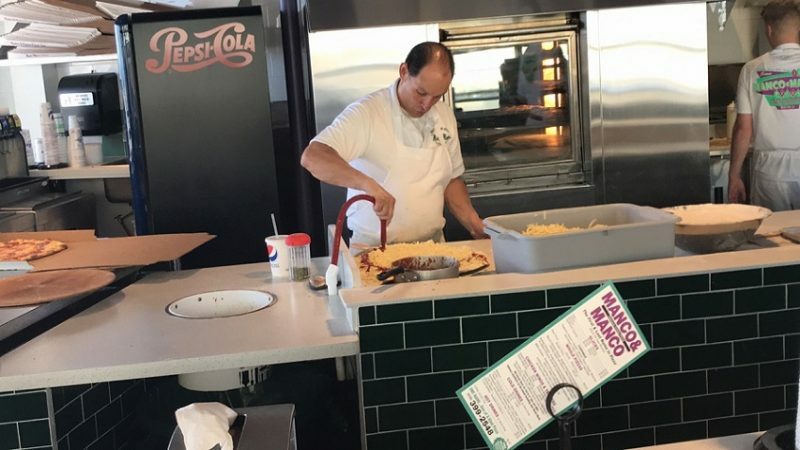 Greg Perks is another longtime veteran Manco & Manco employee, having logged 29 years. Pizza maker Michael DeLuca uses a plastic hose to add pizza sauce to a pie. The famous pizza sauce is pumped onto the dough through a plastic hose. This insures a uniform amount on each pie and speeds the process. “If we used (the traditional) ladle we could never keep up with the demand,” Warlow said. Twirling dough takes more training than talent. 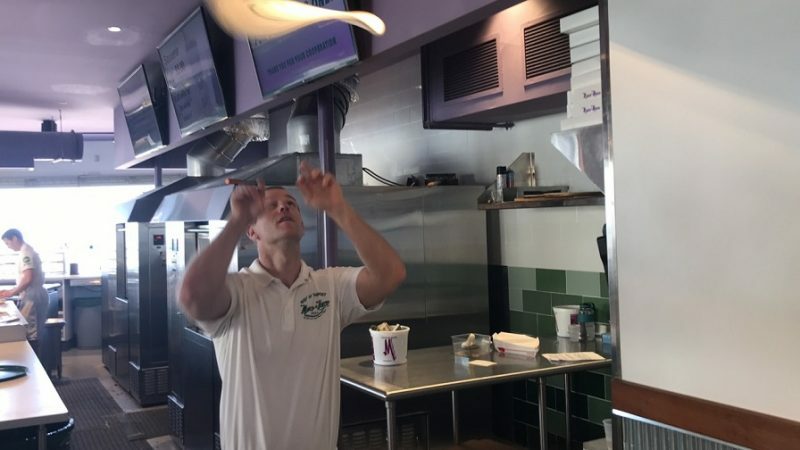 When customers watch a Manco & Manco pizza man nonchalantly toss that homemade dough in the air, it might look like second nature, but it took practice to get there. Employees learn by wetting down a circular piece of fabric and practicing the technique. The pizza palace now sells these fabric “pies” as “Faux Dough” in the gift shop. Manco & Manco Pie man, CJ Warlow, practices his dough twirling technique with Faux Dough, a circular piece of fabric that mimics the twirling action of the real thing. Location, location, location. 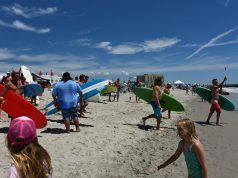 Manco’s 9th street store celebrated its first anniversary earlier this summer. The former Strand movie theatre now hosts pizza making shows every night. 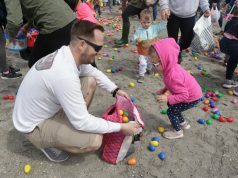 The other stores are at 8th, 12th, and Manco & Manco’s Too, on the mainland at the Ocean Heights Shopping Center in Somers Point. The stars come out to Manco’s. 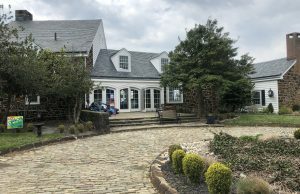 Two days after his Villanova Wildcats won their most recent NCAA mens’ basketball national championship, head coach Jay Wright walked into the store and ordered a pie. The Cleveland Cavaliers’ J.R. Smith made a similar appearance at the 12th Street store. While you may not have known these things, there are some things about Manco & Manco you will never know. “The recipe for our sauce and the way we blend our cheese are things we will never talk about,” Warnow said.